Jim introduced me to Pinzgauers when he happened to pull in next to where I was camped at the Riverside Telescope Maker's Conference near Big Bear, CA a number of years ago. I was looking into Pinzgauers and suggested over dinner going into town to look at one for sale when Jim drove in. I was all over his truck checking it out and asking questions. 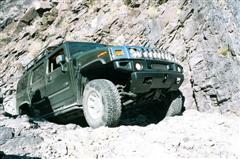 Jim invited me to go out the next day with the Southern California Pinzgauer group for a "treffen" (meet) and was sold. I knew I had to have one. Most of the introductory video was shot at the Calico Mogfest a couple of years ago. This event is usually held over Columbus Day weekend at the Calico KOA in Yermo, CA. This a great event to attend if you're interested in European 4x4 vehicles. There are usually Unimogs, Pinzgauers, Halflingers, VW Syncros, Gelandawagons, and sometimes a Volvo C303 or some other exotic European off road vehicle. Very interesting, Nice trail runs, too. Makes me want to get back on the trail!! Great video! Is that Pinzgauer a 6x6? Jim's vehicle is a Pinzgauer 712W. 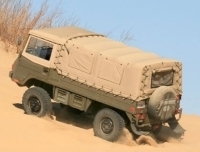 The first generation Pinzgauer 712 models are the 6x6s. 4x4s are 710 models. It's pretty amazing to to be behind a 712 on a rough trail. With fully independent suspension you see 6 axles flailing all over the place but it works very well. They can be a challenge to turn with the rear lockers engaged since both rear axles have lockers and engage together with a single dash mounted lever in the cab.